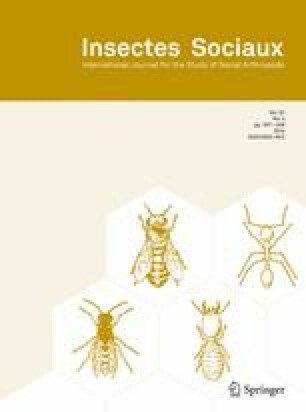 Cooperative or eusocial behavior occurs in gall-inducing insects, but the ecological and evolutionary contexts for these behaviors vary in their details. Foundresses of the manzanita leaf-gall aphid, Tamalia coweni, regularly share galls. Because aphids undergo parthenogenesis, communal foundresses are potential clone mates. Under the kin selection hypothesis, a high level of relatedness is predicted to lower genetically based conflict among females in a group and thereby favor communal gall occupation. We recorded the frequency of communal behavior in a population of T. coweni on its host plant, Arctostaphylos patula, and measured reproductive output in single- and multiple-occupant galls. Eleven percent of the 375 galls examined were communally occupied, with double-foundress galls the commonest class, up to a maximum of five foundresses within galls. Total productivity of communal galls (measured by numbers of offspring per gall) was higher than for single-foundress galls on a per-gall basis, but lower per capita. We genotyped foundresses with amplified fragment length polymorphism (AFLP)-PCR markers, to estimate relatedness among gall co-occupants and foundresses from randomly selected galls in the population. Analysis of genetic distance between communal foundresses revealed that relatedness among gall cohabitants was significantly higher, on average, than for foundresses drawn from the population at random (P < 0.001). Phylogenetic analysis using parsimony (PAUP) of the AFLP profiles indicated that half the foundresses sharing galls were most closely related to their gall mates. Our results are consistent with kin selection theory, and suggest that communal gall occupation in this species may be interpreted as cooperative behavior. This work was performed in partial fulfillment of a Master’s degree in Biological Sciences at California State University, Chico, and was supported by the Big Chico Creek Ecological Reserve and the CSU, Chico Office of Graduate studies. BGT is grateful to Kristina Schierenbeck and Andrea White for their assistance and support, and would like to thank David H. Kistner, the staff of the CSU, Chico Aquatic Bioassessment Lab and the staff of the CSUC Department of Biological Sciences.